The Forbidden City in Beijing, China, with its landscaped gardens, buildings with nearly 10,000 rooms featuring fine furniture and traditional works of art are a priceless testimony to Chinese civilisation during the Ming and Qing dynasties. Traditional Chinese design has a history going back about 5,000 years and follows a philosophy that has a deep connection with the past and plays a momentous role in forming the identity of the Chinese. Imagine having a city modeled in that fashion while blending with the modern vitality of the Western Renaissance. 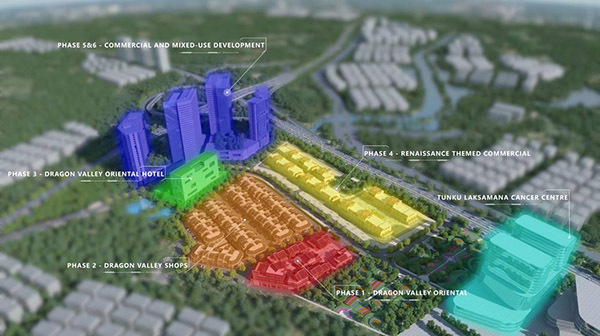 Imagine no more as Iskandar Seafront Assets unveiled an International Cultural Town (ICT), an East meets West development that will showcase all of the above. Strategically located between Flagship A and B of Iskandar Malaysia, ICT will be facing the Coastal Highway and will be easily accessible via the North-South Highway, Malaysia-Singapore Second Link and Skudai Expressway. ICT will cover a total land area of 35acres and a building area of 340,000 square meters. Using the courtyard group or block layout, ICT will combine multi-level special catering to entertainment performances, cultural creativity and business reception points. ICT aspires to be an Instagram friendly fashion hub, the next entertainment bay, trend port, night city and overall one stop attraction for Iskandar Malaysia. “We will be offering 24-hours of one-stop services covering the themes of shopping, food & beverage, leisure, entertainment, business, culture, nightlife, tourism, and others,” said Lindy Tan, the official representative of Iskandar Seafront Assets. Phase one and two of ICT will revolve around the traditional Chinese theme and will be known as the Dragon Valley Oriental and Dragon Valley Shops respectively. Phase three will introduce the Dragon Valley Oriental Hotel while Phase four will be the Renaissance Themed Commercial outlets. Phase five and six are reserved for commercial and mixed-use development. “One of the features, Loon Square will have 15% shopping, 10% entertainment, 20% accommodation, 30% food, 20% leisure activities and 5% for other needs. We will introduce the One-Stop Malaysian Food that will feature a collection of Malaysia’s culinary ‘pride’ as an interesting highlight of ICT,” added Lindy.